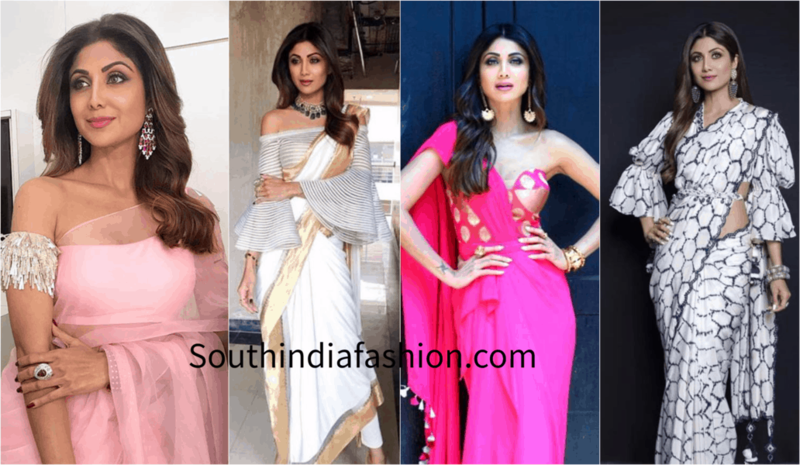 Shilpa Shetty’s Way Of Wearing Saree With A Twist Of Fusion! 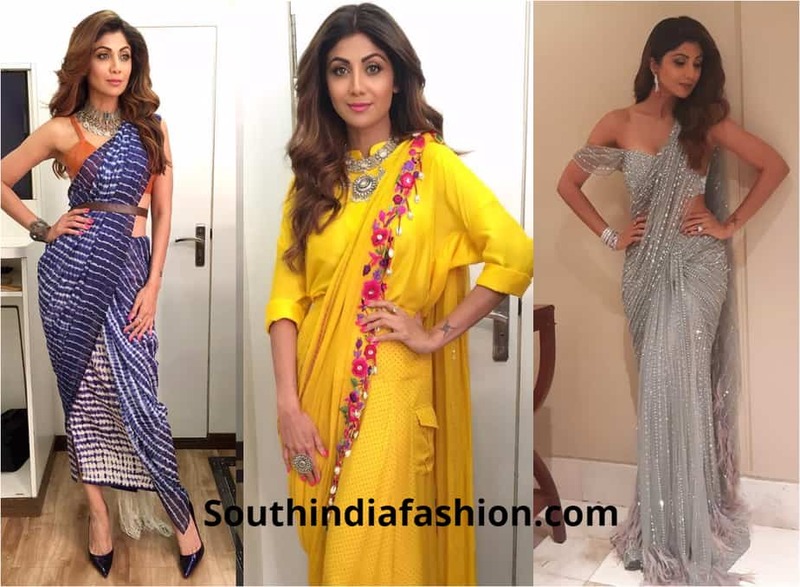 Every saree lover and every Bollywood buff would know that when it comes to experimenting with sarees, no one can beat the ever gorgeous Shilpa Shetty Kundra! With a perfect figure and bold fusion choices, she plays around with saree like a pro. She can wear a saree in the most elegant way and can pull it off with a modern fusion twist! From colors, prints to the way she drapes the saree, there’s always something new in her style statement. Her aesthetic sense of style is excellent and she adorns any kind of clothes with much panache and ease. Be it fusion or completely traditional saree, she carries them in vogue. Just like her saree style, Shilpa Shetty keeps experimenting with her blouse patterns too! With her blouse patterns, she taught us the right way to add an oomph factor to the traditional wear. Her off-shoulder, bell-sleeves, and dramatic sleeves are some examples of how you can bring together everything traditional and fusion. For all the millennials, simple is just boring! And Shilpa Shetty seems like she’s a part of us millennials. Teaming up your saree with an ornate belt is like the easiest way to add that glam quotient to your look. The waist belt accentuates your curves and adds an illusion. Shilpa Shetty was often spotted flaunting this amazing fusion trend. Dramatic fashion is glamorous and Shilpa Shetty shows us how by taking it up a notch! We just cannot get over the green saree and its magnificent see-through leaf replica pallu. 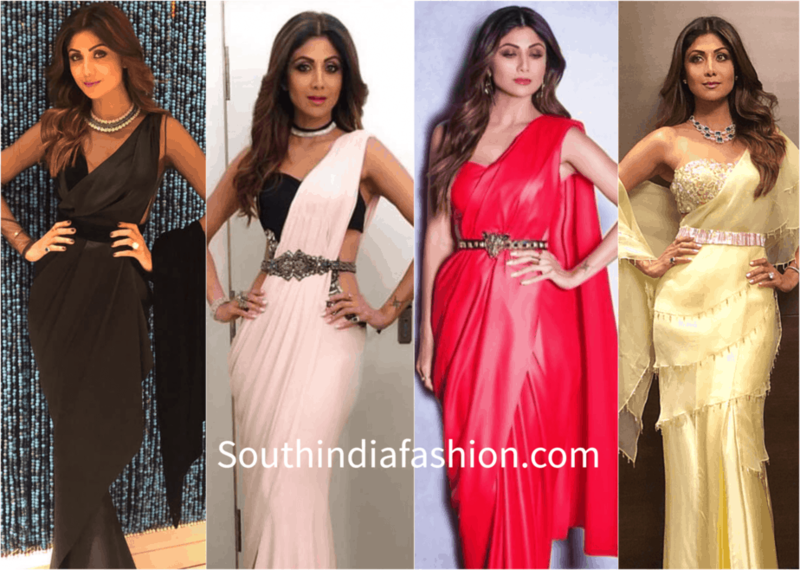 Keep up with the OTT – over the top fusion trend just like Shilpa Shetty! We are guessing Shilpa Shetty loves the tribal embroidery just like we love it! The tribal prints and work are trending these days and it adds that beautiful fusion and earthy touch to your outfit. It’s simple and simply classy. Now, who doesn’t love frills and ruffles? Ruffles, frills, and tassels have that fun and playful feminine vibe to them. It sure adds a hint of retro feels and a lot of refreshing vibe to your saree look. 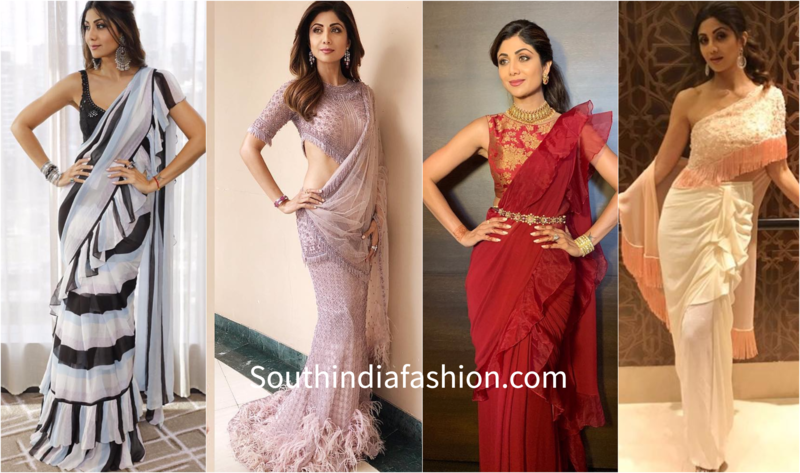 Look at Shilpa Shetty rocking the frills, ruffles, and tassels in various ways and slaying in style! Pant style saree is something we in love with! 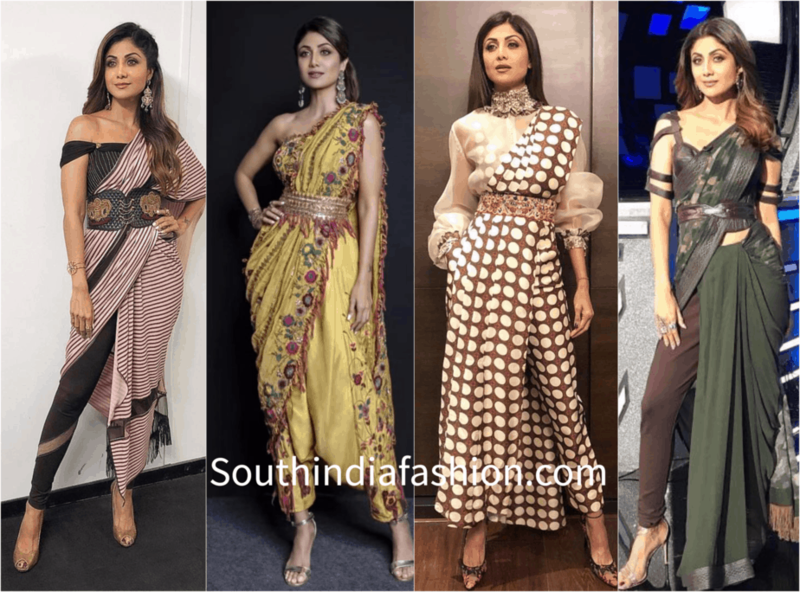 Shilpa Shetty multiple times wore her saree with pants and we could not stop gushing about it each time. Stylish, chic and yet keeping the saree feel intact – pant style saree is fashion goals. 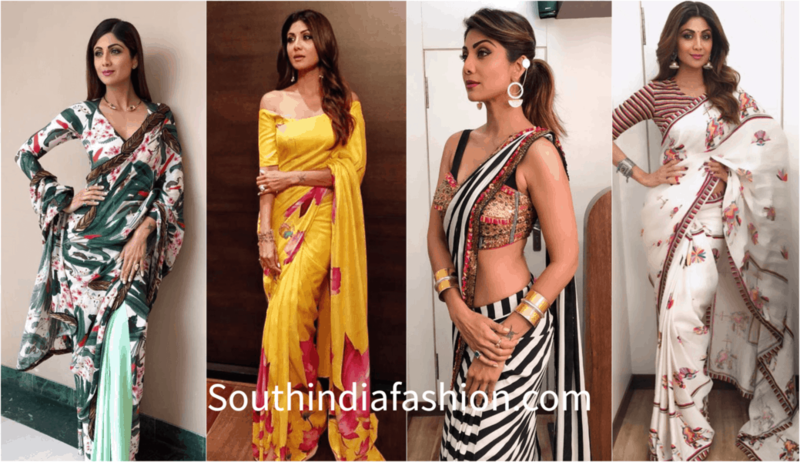 Colorful abstract, floral, strips or motifs there’s nothing that Shilpa Shetty hasn’t tried out! The diva never stops surprising us with how effortless she manages to look. Pair it with an embroidered blouse and contemporary jewellery, there are a million ways you can play around with prints. This Bollywood Diva has taught us that saree never goes out of style. You must know how to play it with the rules and include the latest trends in styling a saree in a fusion way!